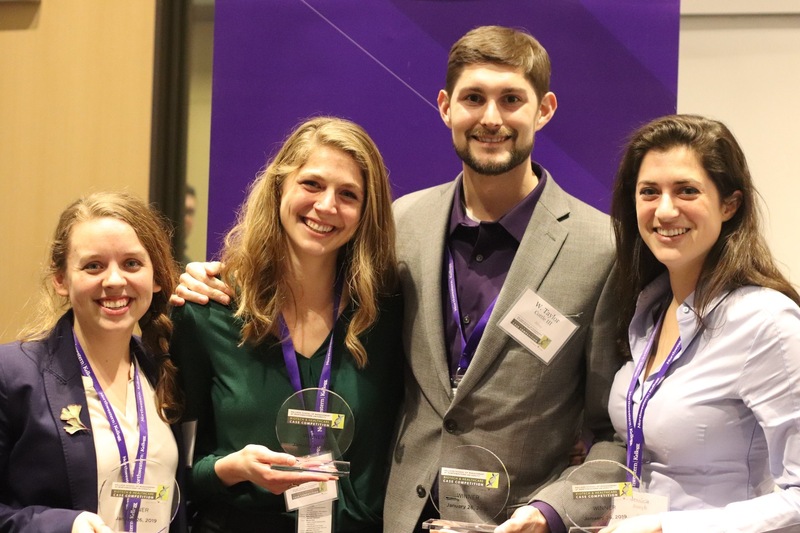 A four-member team of Johns Hopkins University students, including two from the Carey Business School, has won first place in the 16th annual Kellogg Biotech and Healthcare Case Competition, held January 26 at the Kellogg School of Management in Evanston, Illinois. The winning Johns Hopkins team included Elizabeth Phelan, MBA/MPH candidate, Johns Hopkins Carey Business School and Bloomberg School of Public Health, class of 2019; Jenna Fritz, MBA/MPH candidate, Johns Hopkins Carey Business School and Bloomberg School of Public Health, Class of 2020; W. Taylor Cottle, PhD candidate in Biochemistry, Cellular and Molecular Biology, Johns Hopkins School of Medicine; and Jessica Joseph, PhD Candidate in Cellular and Molecular Medicine, Johns Hopkins School of Medicine. The award, with a top prize of $5,000, saw 12 teams selected to participate in the competition, including teams from Harvard Business School, the Booth School of Business at the University of Chicago; the Haas School of Business at the University of California Berkley; the Ross School of Business at the University of Michigan; the Anderson School of Business at UCLA; the McCombs School of Business at the University of Texas Austin; the Kellogg School of Business at Northwestern University; and international schools SDA Bocconi and CEIBS. The challenge presented to all of the teams this year centered on the impact of policy, advocacy, and messaging concerning the reputation of the healthcare industry in the United States. Past challenges, while always centered on a healthcare topic, have varied widely, from forecasting sales of a new molecule to how best to reduce childhood mortality due to pneumonia in Uganda. Case competitions such as this provide unique opportunities to apply academic theory to real-world business and societal challenges. They also offer participating students exposure to and strategic feedback and insight from business executives at major companies like Astellas, the sponsor of this year’s competition.